About three years after graduation, Hollis E. Hughes Jr., '65 MA '72-then a high school social studies teacher-received a call from a fellow alumnus during a Ball State phone-a-thon. The two reminisced about athletic events and late-night study sessions before Hughes agreed to make his first gift to the university, $25 if memory serves him. The South Bend resident said he looked forward to annual calls from alumni volunteers so much that he and his late wife, Lavera (Knight) Hughes, MAE '72, joined the cause. Making a few calls on behalf of Ball State soon turned into trips to campus and Alumni Council involvement. A former member of the Ball State University Board of Trustees, Hughes reflects on more than 30 years of meaningful philanthropy and engagement. The motivation: to support and inspire the next generation to add value to our world. "I have had the pleasure of numerous interactions with outstanding students, many of them at Ball State because of the generosity of donors. They are all so thankful, and they have such grand plans to create positive change. 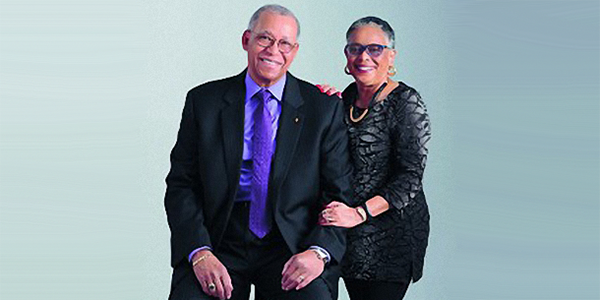 That energy continues to inspire us to give what we can and to encourage others to do the same," says the past Alumni Council chair, who received the Outstanding Black Alumni Award and the Benny Award, both in 1989. "These students and their presence at the institution continues to transform Ball State, and even those of us who have graduated benefit from their enthusiasm and good work because it is elevating the university's reputation." The Hugheses completed an IRA charitable rollover to support the Ball State Alumni Association's efforts and the Cardinal Varsity Club. An IRA rollover allows individuals age 70½ and older to transfer up to $100,000 from an IRA directly to the Ball State Foundation without owing income taxes. Hughes said the gift was a simple, straight-forward transaction with the advantage of tax benefits. "Ball State offers so many gifting options for people in any season of life to contribute what they can to this great university," says Hughes, who has served on the Ball State University Foundation, the Alumni Council, and the Black Alumni Constituent Society Board of Directors. "Our money couldn't be in better hands. Being involved, I've worked with people at the Foundation, and they are leaders in their fields, often being asked to speak at national forums to share their expertise. I've also seen the organization grow and develop, and they are working hard toward building a bright future for Ball State." If careers in education and nonprofit work have taught him anything, it's the power of collaboration, Hughes says. "To continue to impact the lives of students and improve Indiana cities, the university community of alumni and friends must come together to give what they can and engage when they can. It's not the size of the gift or the amount of time you contribute, it's the fact you give or take time to connect that matters," says Hughes. "Having graduated from Ball State, my wife and I were truly appreciative of how much a college education has enriched our lives, both professionally and personally. The Ball State Foundation gives people opportunities to give that gift to other young people who have the drive but not the means." Before his retirement in 2007, Hughes served as president and chief executive officer of the United Way of St. Joseph County for 13 years. He also is a past executive director of South Bend's Model Cities Program and was responsible for planning, coordinating, and allocating the Department of Housing and Urban Development's resources to local government agencies, organizations, and citizen groups. He also served as director of South Bend's Bureau of Housing, president and CEO of the St. Joseph County Housing Assistance Office Inc., and executive director of the St. Joseph County Housing Authority. Lavera taught first grade in the South Bend Community School Corporation for 36½ years before retiring. If you would like to extend your support of Ball State after your lifetime, there are numerous gift options to choose from. To learn more, contact D. Mark Helmus at 765-285-8312 or dmhelmus@bsu.edu.